For a passport collector, it’s crucial to watch the market for documents, and I do so for many years. First of all, you want to know what documents are available, then how frequently are they available and at what price level. This gives you an excellent standpoint to estimate your passport collection and its value. However, looking nowadays into the different sources like online auctions, classic auctions, collectors and flea markets, etc., we can easily see there is not much available anymore when it comes to quality collectibles of significance of passport history. What you find nowadays is plenty of biometric passports, sometimes not even expired! But the early travel documents of historical value are indeed vanishing and are significantly less offered. 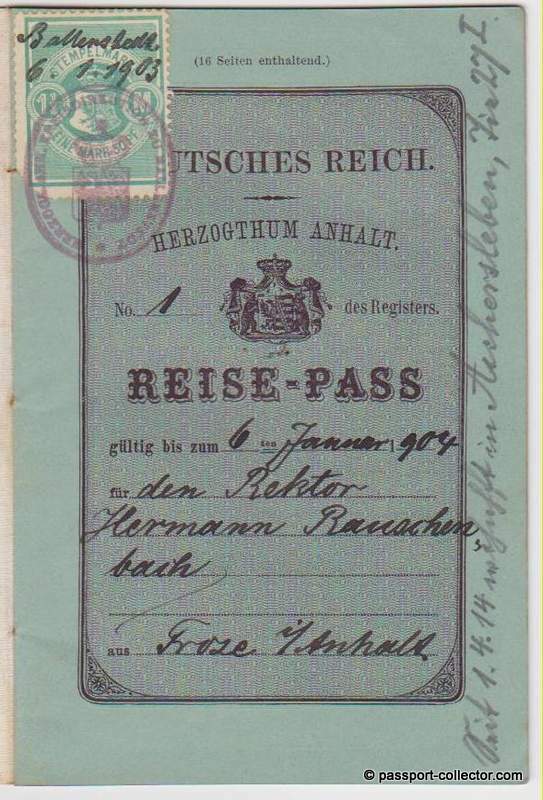 Once in a while, you are lucky, and you can find a rare document e.g., like this German Empire passport of Duchy of Anhalt, which is a rare find. I am not interested in recently expired passports around the world, but hey, every collector defines his field of collection. And that is just fine. I am interested in truly historical documents which are significant for passport history or telling an exciting story or are related to a significant event. Like the passport of Count of Wangenheim, German Ambassador to the Ottoman Empire and whiteness of the Armenian Genocide. Or the passport of Honorable Arthur Henderson and wife, who was awarded the Peace Nobel Prize in 1934 and it is precisely this very passport he traveled with to receive his award. These are historical passport treasures which you don’t find anymore today. I am still aiming to complete all types of the German Empire passports, and I am only missing seven types, but of course, these are the rarest ones. Some types I even never saw in the last 15 years, and I could doubt if they even existed, but surely they did. They are just incredibly rare to find. Don’t forget any collection is also an investment and as I always pray “Collect quality instead of quantity,” you will find out the value of your collection when you stop collecting and probably want to sell your entire collection. At that point, you will see how well you invested in quality documents. Such documents will always be on demand with serious collectors and always fetch a decent value. May the next historical passport treasure find its way into your collection, but be ready to pay a decent price.